16. Auf das Fest aber hatte der Landpfleger / Lass in kreuzigen! 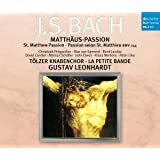 The St. Matthew Passion, Bach's monumental retelling of the story of the Last Supper and the arrest and execution of Jesus, typically runs from two-and-a-half to three hours. Yet this performance makes the time... well, not exactly fly past (consider the subject matter), but it's not tedious for even a second. Much of the credit for this goes to the marvelous Evangelist, Ian Bostridge. 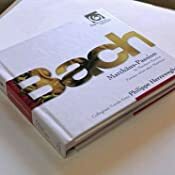 He's an outstanding narrator: the clear tone and diction, skillful timing, and intense involvement with words that made him a famous lieder singer are all in evidence; his part consists of nothing but recitative, yet he holds your interest unfailingly. 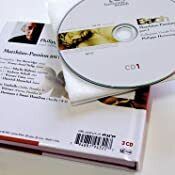 Franz-Josef Selig gives a more dramatic reading of Jesus than you usually hear these days--he may be a bit too "operatic" for some listeners, but he really communicates his character's very human anguish and sorrow. 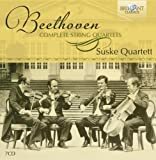 Similarly, soprano Sibylla Rubens, tenor Werner Güra, and bass Dietrich Henschel sometimes unleash a bit too much vibrato for some tastes, but their singing is full-throated and attractive and they're very sensitive to the nuances in the text and music. 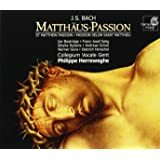 Superstar countertenor Andreas Scholl is the standout--he combines unearthly purity with very earthly feeling and blends beautifully with the baroque instruments. 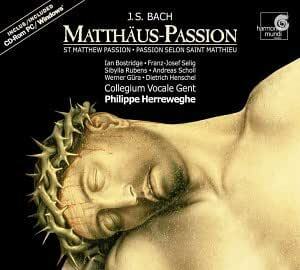 The real stars of the record, however, are Philippe Herreweghe and his remarkable choir and orchestra. 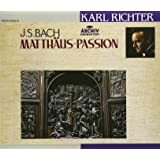 This conductor and his musicians (especially his radiant choir, Collegium Vocale) have always been superb at conveying warmth, devotion, and contemplation, but intense joy, anguish, or anger have sometimes seemed beyond them. Not here: they cover the full emotional range of this work--from reverent reflection to anguished remorse to churning fury--without ever crossing the line into melodrama or sacrificing clarity. 5つ星のうち5.0The best recording of the work in my opinion. This is truly a breathtaking performance. 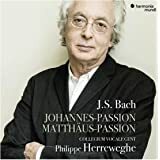 Herreweghe's Bach recordings are my absolute favorite....even more than Harnoncourt. Ian Bostridge;s Evangelist is just incredible. Finally a real tenor navigating the dizzying tessitura of this role, with an intensity, and ease that I could not have imagined. I sang this part many years ago. It is far more challenging than any opera or song cycle I ever performed. Wow! This album is purely fluid and emotionally riveting. Yes, the CdRom is good, especially if you don't know german. 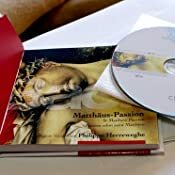 With the CDRom in your computer you can listen to the entire oratorio with a simultaneous English translation on the screen. But the CD is where the album really shines. This is not simply a presentation of the Gospel. The two choirs comment on the action as the story unfolds, angrily, pleadingly, entreatingly. The choirs make the appeal to the audience. Beseeching them, pardon me, beseeching us, in the light of Christ's sacrifice, to repent. On a second level, the soloists react emotionally as individuals to the action of the Gospel. The effect is rather like Greek tragedy, with a chorus behind the actors commenting on the action. In the foreground, Ian Bostridge and FJ Selig are a masterful duo as Evangelist and Jesus carry to motive weight of the oratorio. Half the time I don't know what they are saying, but the music is so powerful and so powerfully performed that I find myself reacting emotionally. And, when I know what they are saying, it's even more instense. The Passion is the perfect matching of form and content. Herrewege's realization of the passion sets the most perfect content in the most perfect form. 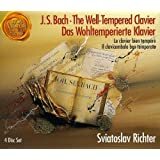 The tempi is perfect. The emotional intensity is right. It breathes. 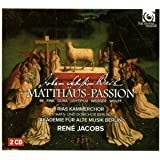 I already owned a wonderful version of Bach's sublime "Passion," but I purchased this one simply because I am a huge fan of the tenor, Ian Bostridge. It was worth every penny. This is, simply, the most beautiful version of this magnificent music that I have ever heard. And Bostridge is absolutely first rate as the "Evangelist." But then every soloist, the orchestra and the chorus are everything one could hope for. 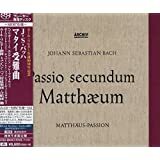 The sound is, as I have come to expect from the Harmonia Mundi label, absolutely full and rich and crisp. I have only looked briefly at the extra cd-rom, but it looks interesting and worthwhile. This is a dream recording that I shall own and play with great happiness.